Beautiful new white crib bedding available in Pink, Blue, Green or Khaki. Bumpers are slip covered in White Pique fabric & corded in solid cotton fabric. Choose from any of our more than 200 fabrics for coordinating sheet. 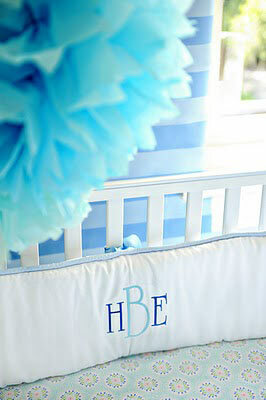 Optional monogramming is available in a variety of fonts and colors!